Attendance Management System is a daily activity at every organization including all types of schools, colleges, and even vocational training centers. Hence it is an important part of a complete School Management System. SkoolApp presents an effective Attendance Management System that is accurate, easy to use, shows meaningful summaries and reports, and comes integrated with an RFID machine as well as mobile app. 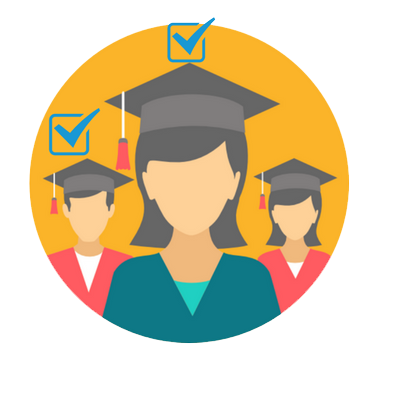 SkoolApp Attendance management system records attendance for Student as well as Teachers. The attendance can be captured at any level. Bus drivers or attendants can mark attendance on the bus, school guards can do so at the School entrance, and teachers and sports coaches can mark it in their class. Attendance can be recorded manually using the mobile app or automatically via RFID machines integration. As soon as the attendance is recorded, an instant notification is sent in real time to the Parents and School Administration via SkoolApp. In SkoolApp, not just a notification, but also a comprehensive summary of entire year’s attendance is shown to parents in form of % attended, % late, % absence in relation to overall school opening days. This uniqueness differentiates SkoolApp from other school management systems and makes it the best school management system in India and Other Countries. School administration by using Attendance Management system can generate several reports by class, year, subjects and see the impact of attendance on overall school’s performance. We have also seen a positive impact on the overall attendance of a child when their parents have a view of this guiding summary. As a whole, Attendance Management System is integrated with several other features in our complete school management system and allows one step processing of data at all places as needed. e.g. eForms, where Parents can apply for leave for their child and then it integrates with attendance system automatically. A unique feature of our Attendance Management System is its utility towards children’s safety. Now days it is important for schools as well as parents to know the whereabouts of their children. Due to our RFID integration it is now possible to trace their child’s movement. This not only increases overall security awareness, but also deters threats. Attendance Management system Powered by SkoolApp ensure Child Security. Up to date records of each class and students using Attendance Management system. Real time notification to parents about presence, absence or late. Reducing the unnecessary workload of school staff so they could focus on their core purpose of education and students well being. Easy reporting and analysis of various factors such as total absences, absences vs students performance etc using Attendance Management System. Parents and school staff jointly dealing with ad-hoc absentees in a proper manner. As a conclusion, moving away from traditional attendance to a smart attendance management system is just a matter of signing for it. The setup of SkoolApp’s Attendance Management System takes less than one hour and starts saving time and money for school’s right away, be it for your school, day care center, coaching center or sports school. 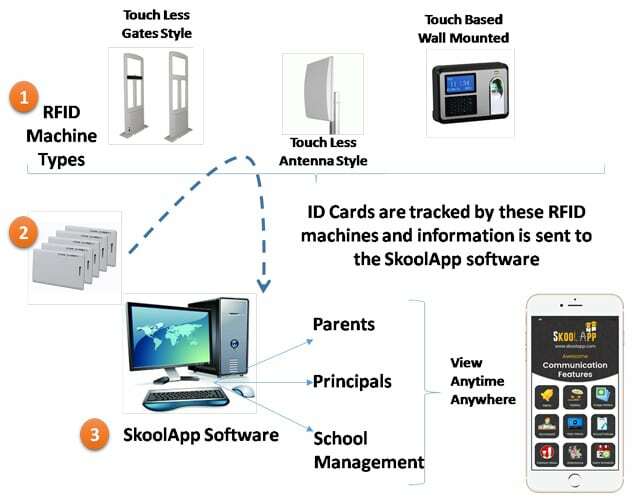 Below is a brief summary of how RFID integrates with SkoolApp. More details and demo can be booked by calling our representatives or sending us an email. Thank you for your interest in our school Attendance management system, one of the best in India. Students and Staff needs to wear the cards and pass through the RFID machine range. Parents and school management can see attendance summary in SkoolApp mobile app as well as SkoolApp Portal using Attendance Management System powered by SkoolApp. Gate Style – These RFID gates control the in and out of students and staff by detecting the RFID cards registered on these gates. Antenna Style – These RFID antenna cover a circular range and any RFID card registered with them is detected when in that range. Touch Based Machines – Touch based machines required RFID cards to be touched to them for detection. However they offer other benefits such as bio – metrics as well as pin code function. So if a school does not want to issue RFID cards, they can instead issue the PIN codes or register finger prints. Once the cards are tracked they transfer the data to SkoolApp software where parents and school Attendance Management System are notified as well as attendance is recorded. These identity cards have a little chip which is registered for a student or staff. One card can only be registered for one student or staff. Attendance Management System feature of this software is highly sophisticated and flexible. It is fit for the needs of various primary, secondary, senior and play schools. It is also fit for large coaching centers where multiple classes are conducted on a daily basis. Attendance Management System of SkoolApp is integrated with RFID. The moment student or staff are in the range of RFID machine, our mobile app used by parents and school management will receive notification. Attendance can also be marked manually without integrating RFID cards. Attendance Management System of SkoolApp is Equipped with latest Technology, which is updated from time to time. Overall it is a great solution that meets the increasing needs of child security as well as attendance related compliance requirements at schools. If you want more Information or discuss with our solution experts about this Attendance Management System, please arrange for an appointment below.